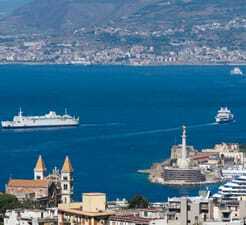 With our Ferry to Messina guide you will get all the info you need in order to plan your ferry crossing to Sicily. Not only will you get a ferry price for your chosen sailing but we’ll also show you prices for ferries to Messina around your preferred departure time as well as sailings to alternative destinations to ensure you get the best available price for your trip. Getting a price or making a booking couldn't be easier. All you need to do is select your preferred Messina route from the menus, number of passengers and hit search. If you are looking for a Messina Ferry departure, please visit our Messina Ferry page. I booked the ticket online and collected it at the counter with ease. There were no problems with the administration or online booking. All the staff were very helpful courteous and pleasant. The ferry was on time and we travelled rapidly to Messina where we disembarked. There are facilities for disabled people as well. No problems to report. A pleasant safe crossing of the Straits of Messina and I would recommend to all potential customers of Direct Ferries. Easy booking online, sailings left on time, fab !